Capri LOVES to wrap anything around her like a necklace or scarf and she loves blankets. I found the idea of play silks or play scarves online and thought it was a great idea. You can buy pre-dyed ones but they run rather steep in price. I found a few different blogs however that talked about dying your own with kool-aid. You can buy plan white ones in various sizes from Dharma Trading Company and they are a great price. I picked up 3 different sizes from them (8×54, 14×72 and a 44×44), and the 8×54 was actually free because it was my first order so that was great. I finally got my kitchen nice and clean and went to work on the play scarves. There are a couple of different methods you can do to make these (microwave or stovetop). 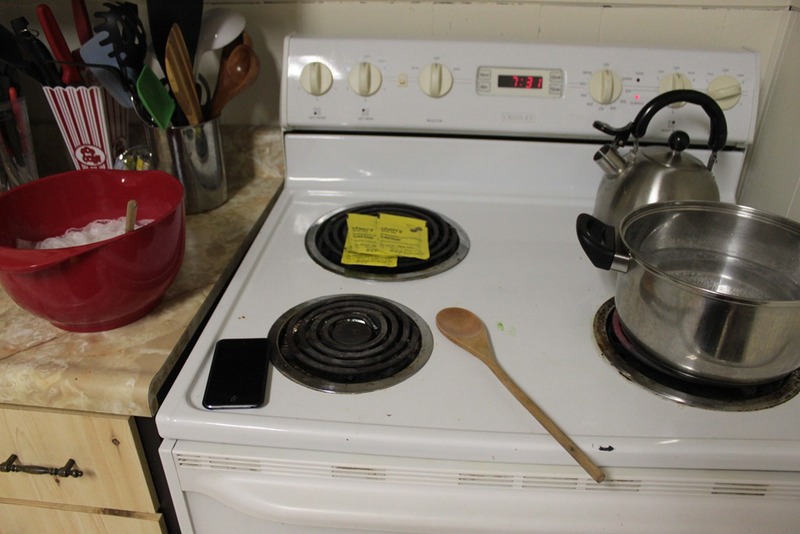 I chose stovetop because it seemed like less work. 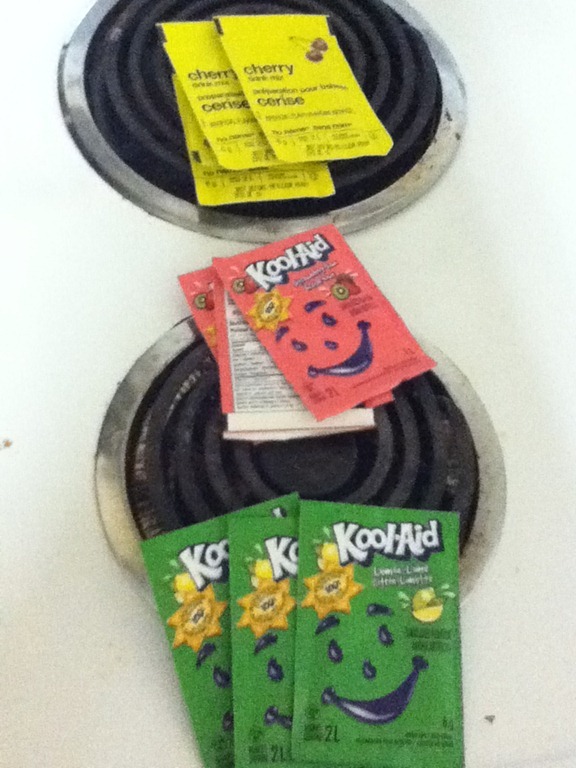 I picked up three different colors of kool-aid (cherry –red, strawberry-kiwi – pink, lemon-lime – green) and after reading a few different blogs decided to go with using more than one package per silk (some suggest just using 1 package I think this would just result in a lighter silk). 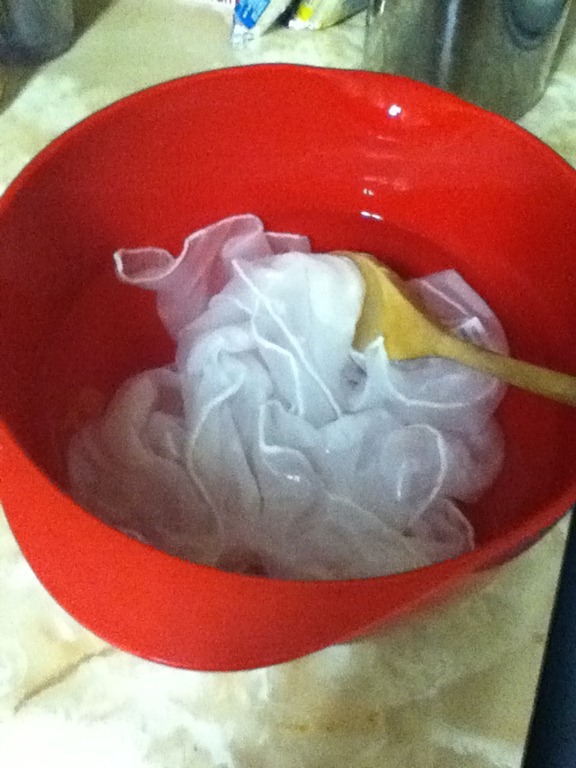 While your pot of water is boiling you put one of your silks in a bowl of hot water and some vinegar (it helps set the color), when the water is just about boiled (like little bubbles) add your koo-aid to the pot (I used a large pot with a few cups of water). For the two smaller silks I used 3 packages of kool-aid each. 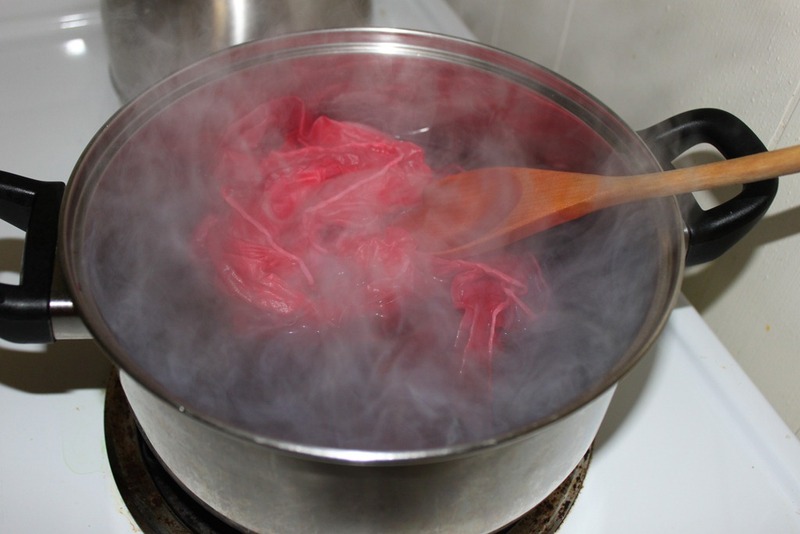 Once your kool-aid is dissolved you can ring out the silk that is in the water/vinegar bowl and put it into the kool- aid water (turn your heat down to medium). Mix it with a wooden spoon to make sure the silk gets as much color as possible (the smaller silk will be the most dyed and evenly because it has more room in the pot). My two bigger silks have more of a tie-dye look to them which is fine. After they have been in for a few minutes your water will be almost clear when this happens take the pot over to the sink and pour through a strainer (that is what I found easiest). You are going to run cold water over the silk and keep squeezing water out of it until it runs clear (this was really hard with the green and red). My hands were FREEZING by the end of this so you might want to wear rubber gloves. 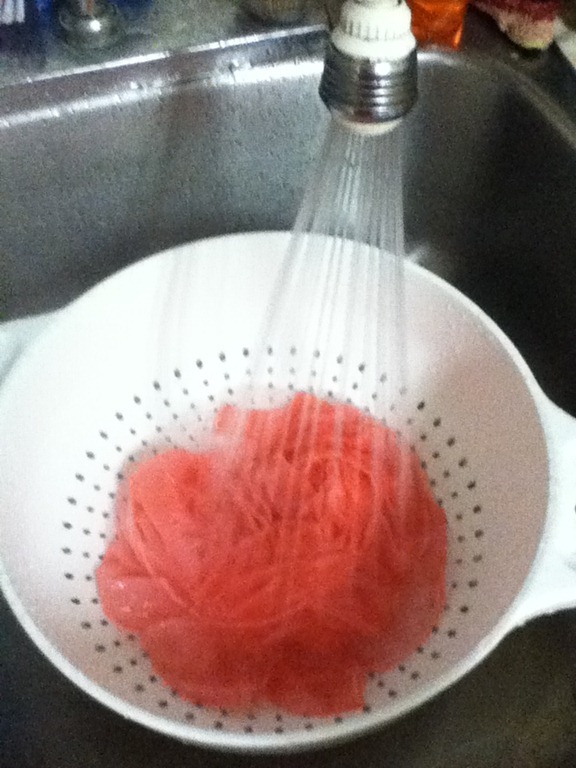 This is a great part for kids to do since it is cold water and not boiling water. 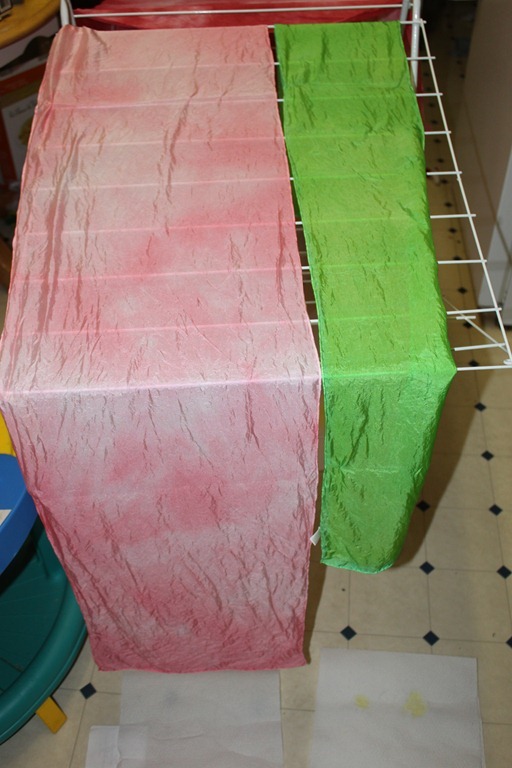 Once they are rinsed you can hang them to dry (my green and red dripped kool-aid water so I put paper towel on the floor to catch it). I can’t wait for Capri to open these on Christmas. She will love them I am sure and will use them for many things. I plan on getting many more sizes (and hopefully the really big one to use as a fort) to add to our collection. I also found that I could not get a lot of colors of kool-aid this time of year which was sad since I really wanted a blue one (which you have to get blue raspberry, not fruit punch). 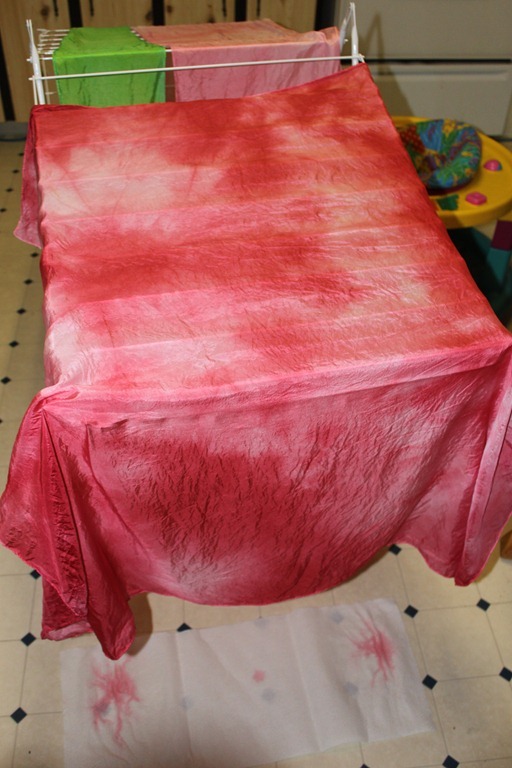 So here are the silks after they had dried. You can check out Part 1 in the Homemade Christmas Presents here and hopefully I will get to Part 3 in the next few days. Great idea. This may be my 10 month old daughter’s birthdat gift. Thanks!